McDonald’s Canada announced today that the food chain will offer books in its Happy Meals at participating restaurants for a two-week promotion starting November 1, while supplies last. The promotion includes four limited edition books, offered in sequence, which feature Happy Meal original characters with fun and playful themes, and a focus on nutrition and imagination. 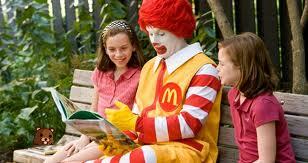 The company is also introducing monthly e-books, which are available on McPlay, McDonald’s Happy Meal app. The books were developed to bring each character and their adventures to life, while delivering a nutritional message that’s relatable for children. Customers can also interact with a digital version of The Goat Who Ate Everything – the first e-book available for free download via McPlay. The launch of Happy Meal books is supported by marketing elements including a TV spot and in-store merchandising.